Bruce W. Winter | Amazing Lookalike! On the left is Dr. Bruce W. Winter, lecturer in New Testament at the Queensland Theological College, and previously the warden of Tyndale House at Cambridge. 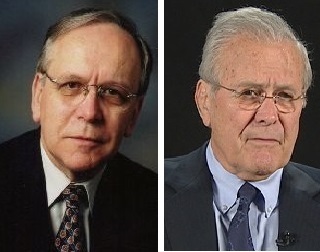 On the right is Donald Rumsfeld, U.S. Secretary of Defence under Presidents Ford and Bush and supporter of enhanced torture techniques by the U.S. military.